The word cosmogony means: “a theory of the origin of the universe, the study of the origin and development of the universe or of a particular system in the universe, such as the solar system”. Among all the different nations, tribes, languages, and cultures of the people of Africa, the traditional African religions have a shared cosmogony. One of the reasons that this is so is because there is a priesthood that has members among all the different African tribes, that dates back to a priest of Isis (Auset) during the reign of Pharaoh Khufu, the 3rd dynasty (3900 BCE) builder of the Great Pyramid in Egypt (Kemet). 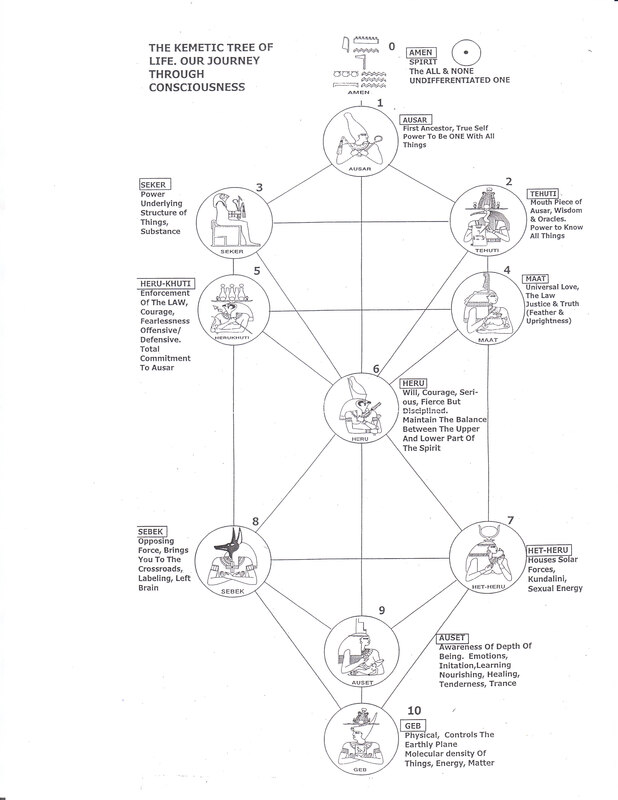 The members of this Kemetic priesthood encapsulated their cosmogony in a diagram known as the Tree of Life (pictured above). The Tree of Life is a diagram of the process through which God creates the world, humanity, and humanity’s sojourn in the world. The Tree consists of eleven spheres, numbered from zero to 10. Sphere 0 is at the top, and is depicted as being “above” the tree. It depicts and corresponds to the state of God and of existence before the creation of the thingly, phenomenal world. In the Kemetic tradition, this aspect of God was known variously as Amen, Atum, Aten, Nu, and Nut. In this edition of COMPLETE CONSTRUCTIVE CHANGE, I want to deal with a particular aspect of the cosmogony represented by the Tree of Life. In the Beginning, before Time and before Space and before the Big Bang, there was darkness. There were two things present within the darkness: Mind and Matter. Only 5% of the universe is composed of what we normally think of as Matter, which is physical objects that can be seen by the human eye. 95% of the universe is still composed of this Dark Matter which existed in the beginning, cannot be directly observed, but is the stuff that all observable Matter came out of. Along with the Matter in the beginning was Mind. There was a consciousness in the darkness that was aware of its own existence but wasn’t able to know anything about itself because it had nothing to compare itself to. The reason we know that there is such a thing as “tall” is because we have some experience of a thing called “short”. We know “happy” because we can compare it to “sad”. Nothing can be known without having some experience of its opposite. So this original Mind or Consciousness, which is what most people refer to as “God”, decided that it wanted to experience itself. But it was the only thing in existence. So it had to separate itself into different phenomena that could be compared to each other so that it could learn what it was made of. This original separation is what science calls The Big Bang. It was God starting the process of learning about him/her/itself. The source of all creation is pure consciousness…pure potentiality seeking expression from the unmanifest to the manifest. And when we realize that our true Self is one of pure potentiality, we align with the power that manifests everything in the universe. As human beings, we are little microcosms of the universe. We contain the same stuff that makes up everything else around us and we come into being in the same way that everything else around us does. This is why it is true that we can master the whole universe by mastering ourselves. That Mind that sought to experience itself in the beginning of existence is the same Mind that forms the basis of our existence. We are the primary vehicle by which the God experiences him/her/itself. We have a unique level of self-awareness which causes us to ponder such things as “what is the meaning of life?” and “what is my purpose?” We are the Mind of God and the Mind of God is us. At our most fundamental level, we are simply Mind and Matter. Now what practical lessons for life can we gain from this? Mind can be separated into two basic divisions: Consciousness and Will. Consciousness represents the passive polarity, and Will the active polarity, of the same essential quality. The principle of Matter may be seen as a continuum, which may more properly be called Energy/Matter, because “matter” in the strict sense is but one extreme of that continuum, being “energy-slowed-down.” Implicit in that notion is the fact known to Western science at least since Einstein, namely that energy and matter are mutually transmutable. As reflected at Sphere 0 above the Tree, the essential quality of Mind is a state of bliss, peace, hetep, the Kemetic word for a state of unshakable inner peace. The essential quality of Matter, at Sphere 0, in the state of Amen, is that of pure Potential, which means there is as yet no motion, [Note: The Hindu word nirvana also characterizes the state of Amen, and means, literally, “no motion” (nir = “no” + vana = “motion”).] no vibration, no “things”, therefore no space, and no time. There is also no light, since light is a vibration, and there is no motion. So, our experiences in life are perceived by our five senses which fall under the Matter side of things. Most people mistakenly believe that our minds are shaped by our experiences. However, the Tree of Life allows us to see that our basic nature is pure potential which goes along with our minds being completely unconditioned and not programmed. Our basic state is a blank slate. And we can use the faculty of Mind to choose how we want to perceive anything taken in by the material five senses. Mind and Matter are separate. There is absolutely no obligation on the Mind to feel any particular way about a material experience. And as we go further down the spheres in the Tree of Life we discover that in fact, our minds attract our material experience. The energy broadcast coming from the Mind attracts things from the Matter side to us that match the frequency of the thoughts coming from the Mind. So we create everything that we experience, and if we don’t like our experience then we can choose a different one. We can Will something different into our existence by changing the quality of our Consciousness. More on this at a later time…Peace.